In the Victorian period, the boy’s fashion underwent remarkable changes. The dresses worn by both boys and girls were alike until they were five years old and were made from cotton or wool that was easily available around the house. However, their dressing style changed as they grew up. The invention of the domestic sewing machine in 1851, it was easy for people to make clothes at home. 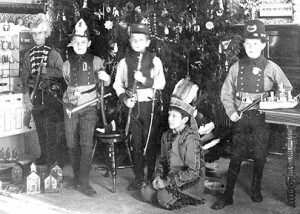 Victorian boy’s clothes were of dark or bright colors. 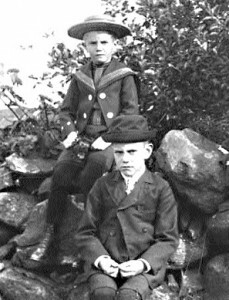 Fauntleroy suits were in fashion for boys. This consisted of a velvet tunic or jacket with corresponding breeches and a lace collar. The sailor suit which was first seen on Queen Victoria’s eldest son was popular for both boys and girls. Boys in the Victorian era wore dresses instead of breeches or trousers till they were five years old. The dresses were made shorter as they reached the age where they learned to walk. There were no specific dresses styled for the boys. It was common for boys to wear dresses until they were five years old, but as such there was no set age as to when can the dresses be worn. In the majority of families, the boys clothing was a matter decided by his mother. A boy’s dress was commonly worn over similar drawers or pantalettes. Tunics were worn by younger boys after breeching. The large sailor-style collars and contrast rows of braiding decorated the clothing of boys in the later years of the Victorian era. Boys wore dresses until they were five. The change from dress to a regular men’s clothing was regarded as a sign that the boys are ready to become men. Boys usually wore knickers-boxer suits that had baggy knee pants. The top half of the suit would button the pants. Normally the suit would have brass buttons or some type or braiding on the collar and cuffs. Boys wore a shirt underneath their suit. The shirt was made of wool and had a waistcoat over it. On colder days, the boys wore a simple jacket over their suit in order to keep themselves warm.